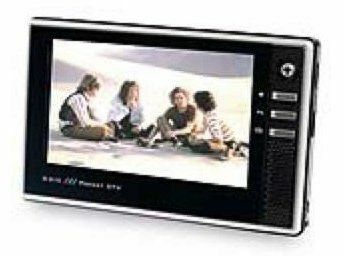 A widescreen 4-inch LCD screen that fits in your pocket is the attraction of the MSI D310: a TV and media player that, on size alone, is the last word in portable. On paper the MSI sounds great: it's got a built-in digital tuner, plays JPEGs and MP3s, built-in games and an electronic program guide (EPG). Unfortunately, the pictures don't cut the mustard. We may be expecting too much from a tiny TV with basic connections, but the flip-up internal aerial is inadequate for our reception area (and that's London), meaning lousy pictures. Granted, things improve dramatically once we get the provided external aerial on the case, but it looks like Crystal Palace's antenna grafted onto a Lilliputian-size screen. And it would be inconvenient to lug around while travelling, defeating the object a bit. Once you manage to get tuned in, pictures from digital broadcasts are only average. We tuned in, turned on and dug the vibes of The Doors bioflick, but its psychedelic colours were a little too much for the D310 and lacking in sharpness. Blacks were grey, and motion smearing was on the rampage. At least you could see what was going on when the reception was good. Sonically, the speakers are below par: use headphones for best results. We got the best results from listening to the digital radio, as its broadcasts were crisp and clear.